Who are the parties involved in import customs clearance formalities in Iran? What is the customs process in Iran to import? How is import cargo released from Iran Customs to importer? Import cargo clearance in Iran Customs. 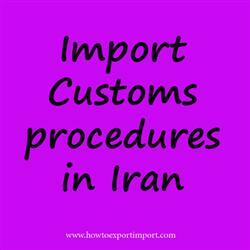 The information provided here details on how to import goods to Iran especially import customs clearance procedures in Iran. The Islamic Republic of Iran Customs Administration (IRICA) is a governmental organisation who is responsible for import, Export and Transit of goods and also accountable for carrying out customs' laws and receiving Customs duties of imports and exports in Iran. Import customs procedures required in KISH ISLAND. Import Customs process in BANDAR KHOMEINI. Process to import to BANDAR ABBAS . Requirements of customs to import to Tehran. Customs requirements in Tabriz to import. Customs needed to import to Shiraz. How can I clear customs to import in Qeshm. What Customs formalities required to import in Mashhad. What should I do to import goods in Mehrabad. How to get import customs permission in Tehran. Procedure to get customs clearance to import in Mashhad. Mandatory process need to complete import in Mashhad The way to get customs clearance process to import in Kish Island.